The culture of Iran (Persian: فرهنگ یران‎, translit. Farhang-e Irān), also known as culture of Persia, is one of the oldest in the world. 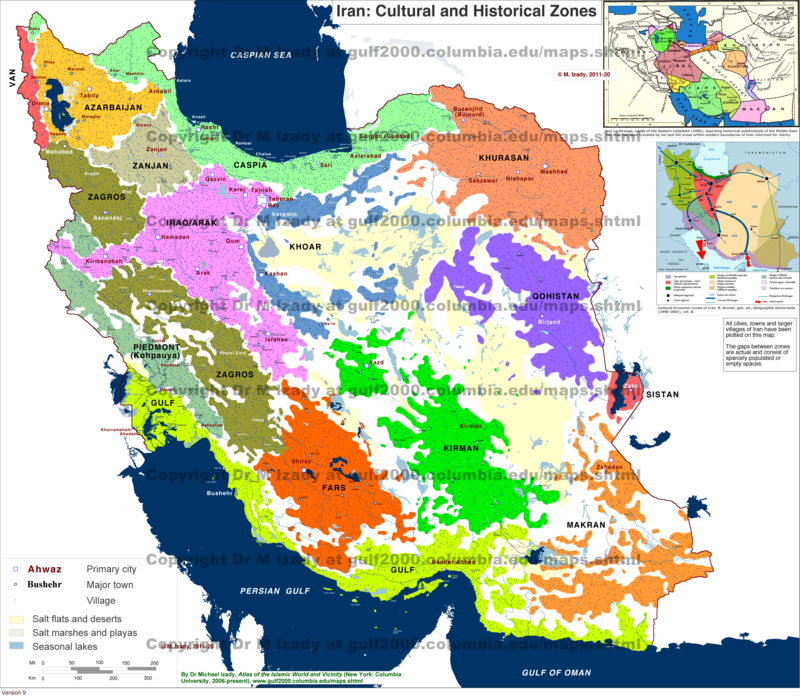 Owing to its dominant geo-political position and culture in the world, Iran has directly influenced cultures and peoples as far away as Italy, Macedonia, and Greece to the West, Russia to the North, the Arabian Peninsula to the South, and South and East Asia to the East. Thus an eclectic cultural elasticity has been said to be one of the key defining characteristics of the Persian spirit and a clue to its historical longevity. Furthermore, Iran's culture has manifested itself in several facets throughout the history of Iran as well as the Caucasus, Central Asia, Anatolia, and Mesopotamia. Followers of the Baha'i faith comprise the largest non-Muslim minority in Iran. Followers of the Baha'i faith are scattered throughout small communities in Iran, although there seems to be a large population of people who follow the Baha'i faith in Tehran. Most of the Baha'i are of Persian descent, although there seem to be many among the Azerbaijani and Kurdish people. The Baha'i are severely persecuted. Followers of the Christian faith comprise around 250,000 Armenians, around 32,000 Assyrians, and a small number of Roman Catholic, Anglican, and Protestant Iranians that have been converted by missionaries in earlier centuries. Thus, Christians that live in Iran are primarily descendants of indigenous Christians that were converted during the 19th and 20th centuries. Judaism is an officially recognized faith in Iran, and in spite of the hostilities between Iran and Israel over the Palestinian issue, the millennia old Jewish community in Iran enjoys the right to practice their religion freely as well as a dedicated seat in parliament to a representative member of their faith. In addition to Christianity and Judaism, Zoroastrianism is another officially recognized religion in Iran, although followers of this faith do not hold a large population in Iran. In addition, although there have been isolated incidences of prejudice against Zoroastrians, most followers of this faith have not been persecuted for being followers of this faith. There are two stages in a typical wedding ritual in Iran. Usually both phases take place in one day. The first stage is known as "Aghd", which is basically the legal component of marriage in Iran. In this process, the Bride and Groom as well as their respective guardians sign a marriage contract. This phase usually takes place in the bride's home. After this legal process is over, the second phase, "Jashn-e Aroosi" takes place. In this step, which is basically the wedding reception, where actual feasts and celebrations are held, typically lasts from about 3–7 days. The ceremony takes place in a decorated room with flowers and a beautifully decorated spread on the floor. This spread is typically passed down from mother to daughter and is composed of very nice fabric such as "Termeh" (cashmere), "Atlas" (gold embroidered satin), or "Abrisham" (silk). Items are placed on this spread: a Mirror (of fate), two Candelabras (representing the bride and groom and their bright future), a tray of seven multi-colored herbs and spices (including poppy seeds, wild rice, angelica, salt, nigella seeds, black tea, and frankincense). These herbs and spices play specific roles ranging from breaking spells and witchcraft, to blinding the evil eye, to burning evil spirits. In addition to these herbs/spices, a special baked and decorated flatbread, a basket of decorated eggs, decorated almonds, walnuts and hazelnuts (in their shell to represent fertility), a basket of pomegranates/apples (for a joyous future as these fruits are considered divine), a cup of rose water (from special Persian roses)—which helps perfume the air, a bowl made out of sugar (apparently to sweeten life for the newlywed couple), and a brazier holding burning coals and sprinkled with wild rue (as a way to keep the evil eye away and to purify the wedding ritual) are placed on the spread as well. Finally, there are additional items that must be placed on the spread, including a bowl of gold coins (to represent wealth and prosperity), a scarf/shawl made of silk/fine fabric (to be held over the bride and groom’s head at certain points in the ceremony), two sugar cones—which are ground above the bride and groom's head, thus symbolizing sweetness/happiness, a cup of honey (to sweeten life), a needle and seven strands of colored thread (the shawl that is held above the bride and groom’s head is sewn together with the string throughout the ceremony), and a copy of the couple’s Holy Book (other religions require different texts); but all of these books symbolize God's blessing for the couple. An early age in marriage—especially for brides—is a long documented feature of marriage in Iran. While the people of Iran have been trying to legally change this practice by implementing a higher minimum in marriage, there have been countless blocks to such an attempt. Although the average age of women being married has increased by about five years in the past couple decades, young girls being married is still common feature of marriage in Iran—even though there is an article in the Iranian Civil Code that forbid the marriage of women younger than 15 years of age and males younger than 18 years of age. There are countless numbers of traditional tea-houses (chai khooneh) throughout Iran, and each province features its own unique cultural presentation of this ancient tradition. However, there are certain traits which are common to all tea-houses, especially the most visible aspects, strong chai (tea) and the ever-present ghalyan hookah. Almost all tea-houses serve baqleh, steam boiled fava beans (in the pod), served with salt and vinegar, as well as a variety of desserts and pastries. Many tea-houses also serve full meals, typically a variety of kebabs, as well as regional specialties. The Persian garden was designed as a reflection of paradise on earth; the word "garden" itself coming from Persian roots. The special place of the garden in the Iranian heart can be seen in their architecture, in the ruins of Iran, and in their paintings. Cuisine in Iran is considered to be one of the most ancient forms of cuisine around the world. Bread is arguably the most important food in Iran, with a large variety of different bread, some of the most popular of which include: nan and hamir, which are baked in large clay ovens (also called "tenurs"). In Iranian cuisine, there are many dishes that are made from dairy products. One of the most popular of which includes yoghurt ("mast")—which has a specific fermentation process that is widely put to use amongst most Iranians. In addition, mast is used to make soup and is vital in the production of oil. In addition to these dairy products, Iranian cuisine involves a lot of dishes cooked from rice. Some popular rice dishes include boiled rice with a variety of ingredients such as meats, vegetables, and seasonings ("plov") including dishes like chelo-horesh, shish kebab with rice, chelo-kebab, rice with lamb, meatballs with rice, and kofte (plain boiled rice). In addition, Iranian cuisine is famous for its sweets. One of the most famous of which includes "baklava" with almonds, cardamom, and egg yolks. Iranian sweets typically involve the use of honey, cinnamon, lime juice, and sprouted wheat grain. One very popular dessert drink in Iran, "sherbet sharbat-portagal", is made from a mixture of orange peel and orange juice boiled in thin sugar syrup and diluted with rose water. Just like the people of many Middle Eastern countries the most preferred drink of the people of Iran is tea (without milk) or "kakhve-khana". Since the 1979 Revolution, Iranian women have had more opportunities in some areas and more restrictions in others. One of the striking features of the Revolution was the large scale participation of women from traditional backgrounds in demonstrations leading up to the overthrow of the monarchy. The Iranian women who had gained confidence and higher education during the Pahlavi era participated in demonstrations against the Shah to topple the monarchy. The culture of education for women was established by the time of revolution so that even after the revolution, large numbers of women entered civil service and higher education, and in 1996 fourteen women were elected to the Islamic Consultative Assembly. In 2003, Iran's first woman judge during the Pahlavi era, Shirin Ebadi, won the Nobel Peace Prize for her efforts in promoting human rights. According to a UNESCO world survey, at the primary level of enrollment Iran has the highest female to male ratio in the world among sovereign nations, with a female to male ratio of 1.22 : 1.00. By 1999, Iran had 140 female publishers, enough to hold an exhibition of books and magazines published by women. As of 2005, 65% of Iran's university students and 43% of its salaried workers were women. and as of early 2007 nearly 70% of Iran's science and engineering students are women. This has led to many female school and university graduates being under-utilized. This is beginning to have an effect on Iranian society and was a contributing factor to protests by Iranian youth. During recent decades, Iranian women have had significant presence in Iran's scientific movement, art movement, literary new wave and contemporary Iranian cinema. Women account for 60% of all students in the natural sciences, including one in five PhD students. From the humble brick, to the windmill, Persians have mixed creativity with art and offered the world numerous contributions. What follows is a list of just a few examples of the cultural contributions of Greater Iran. (10,000 BC) - Earliest known domestication of the goat. (6000 BC) - The modern brick. Some of the oldest bricks found to date are Persian, from c. 6000 BC. (5000 BC) - Invention of wine. Discovery made by University of Pennsylvania excavations at Hajji Firuz Tepe in northwestern Iran. (5000 BC) - Invention of the Tar (lute), which led to the development of the guitar. (3000 BC) - The ziggurat. The Sialk ziggurat, according to the Cultural Heritage Organization of Iran, predates that of Ur or any other of Mesopotamia's 34 ziggurats. (3000 BC) - A game resembling backgammon appears in the east of Iran. (1400 BC - 600 BC) - Zoroastrianism: where the first prophet of a monotheistic faith arose according to some scholars, claiming Zoroastrianism as being "the oldest of the revealed credal religions, which has probably had more influence on mankind directly or indirectly, more than any other faith". (576 BC - 529 BC) - The Cyrus Cylinder: The world's first charter of human rights. (521 BC) - The game of Polo. (500 BC) - First Banking System of the World, at the time of the Achaemenid, establishment of Governmental Banks to help farmers at the time of drought, floods, and other natural disasters in form of loans and forgiveness loans to restart their farms and husbandries. These Governmental Banks were effective in different forms until the end of Sassanian Empire before invasion of Arabs to Persia. (500 BC) - The word Check has a Persian root in old Persian language. The use of this document as a check was in use from Achaemenid time to the end of Sassanian Empire. The word of [Bonchaq, or Bonchagh] in modern Persian language is new version of old Avestan and Pahlavi language "Check". In Persian it means a document which resembles money value for gold, silver and property. By law people were able to buy and sell these documents or exchange them. (500 BC) - World's oldest staple. (500 BC) - The first taxation system (under the Achaemenid Empire). (500 BC) - "Royal Road" - the first courier post. (500 BC) - Source for introduction of the domesticated chicken into Europe. (500 BC) - First cultivation of spinach. (400 BC) - Ice cream. (250 BC) - Original excavation of a Suez Canal, begun under Darius, completed under the Ptolemies. (50 AD) - Peaches, a fruit of Chinese origin, were introduced to the west through Persia, as indicated by their Latin scientific name, Prunus persica, from which (by way of the French) we have the English word "peach." (271 AD) - Academy of Gundishapur - The first hospital. (700 AD) - The cookie. (700 AD) - The windmill. (864 AD - 930 AD) - First systematic use of alcohol in Medicine: Rhazes. (1000 AD) - Tulips were first cultivated in medieval Persia. (1000 AD) - Introduction of paper to the west. (935 AD - 1020 AD) - Ferdowsi writes the Shahnama (Book of Kings) that resulted in the revival of Iranian culture and the expansion of the Iranian cultural sphere. (980 AD - 1037 AD) - Avicenna, a physician, writes The Canon of Medicine one of the foundational manuals in the history of modern medicine. (1048 AD - 1131 AD) - Khayyam, one of the greatest polymaths of all time, presents a theory of heliocentricity to his peers. His contributions to laying the foundations of algebra are also noteworthy. (1207 AD - 1273 AD) - Rumi writes poetry and in 1997, the translations were best-sellers in the United States. Algebra and Trigonometry: Numerous Iranians were directly responsible for the establishment of Algebra, the advancement of Medicine and Chemistry, and the discovery of Trigonometry. Wind catchers, ancient air residential conditioning. ↑ Shaul Shaked, From Zoroastrian Iran to Islam, 1995; and Henry Corbin, En Islam Iranien: Aspects spirituels et philosophiques (4 vols. ), Gallimard, 1971-3. ↑ "Iran Index of Religion". About.com. ↑ "Iran Holidays 2013". Q++ Studio. ↑ "Persian Wedding Traditions and Customs". Farsinet.com. ↑ Momeni, Djamehid (August 1972). "The Difficulties of Changing the Age at Marriage in Iran". Journal of Marriage and Family. 34: 545. doi:10.2307/350454. ↑ Opie, James (1981). Tribal Rugs of Southern Persia. Portland, OR. p. 47. ↑ "Persian Rugs, Persian Carpets, and Oriental Rugs". Farsinet.com. ↑ Esman, Abigail R. (10 January 2011). "Forbes: Why Today's Iranian Art is One of your best investments". ↑ "Iranian National Cuisine". The Great Silk Road. Archived from the original on 2011-09-28. ↑ "Adult education offers new opportunities and options to Iranian women". Ungei.org. 6 March 2006. Retrieved 20 May 2013. ↑ "Girls to boys ratio, primary level enrolment statistics - countries compared". NationMaster. Retrieved 20 May 2013. ↑ Masood, Ehsan (2 November 2006). "Islam and Science: An Islamist revolution". Nature. 444 (7115): 22–25. doi:10.1038/444022a. Retrieved 24 June 2017 – via nature.com. ↑ "Iranian Women Hear the Call of Science". 290. sciencemag.org: 1485. doi:10.1126/science.290.5496.1485. Retrieved 13 January 2016. ↑ Zeder, M.A. (2001). "A metrical analysis of a collection of modern goats (Capra hircus aegargus and c.h. hircus) from Iran and Iraq: Implications for the study of caprine domestication". JAS. 28: 61–79. doi:10.1006/jasc.1999.0555. ↑ Zeder, M.A. (2008). "Domestication and early agriculture in the Mediterranean Basin: Origins, diffusuion, and impact". PNAS. 105 (33): 11597–11640. doi:10.1073/pnas.0801317105. PMC 2575338 . ↑ Zeder, M.A. ; Hesse, B. (2000). "The initial domestication of goats(capra hircus) in the Zagros mountains 10,000 years ago". Science. 287: 2254–2257. doi:10.1126/science.287.5461.2254. ↑ MacHugh, D.E. ; Bradley, D.G. (2001). "Livestock genetic origins : Goats buck the trend". PNAS. 98 (10): 5382–5384. doi:10.1073/pnas.111163198. PMC 33220 . ↑ Link: University of Pennsylvania "Archived copy". Archived from the original on 16 December 2008. Retrieved 2009-07-31. ↑ Mary Boyce, "Zoroastrians", London, 1979, 1. Zoroastrianism had an important impact on Judaism, and thus indirectly, on Christianity and Islam. Zoroaster himself was not an ethnic Persian, but (possibly) an ethnic Bactrian who were closely related to Persians. "Archived copy". Archived from the original on 7 September 2005. Retrieved 2007-03-05. "Archived copy". Archived from the original on 2 June 2008. Retrieved 2005-02-01. "Archived copy". Archived from the original on 15 January 2012. Retrieved 21 January 2012. ↑ Link: "Archived copy". Archived from the original on 29 November 2013. Retrieved 11 April 2014. ↑ Refer to article by the Christian Science Monitor - http://www.csmonitor.com/1997/1125/112597.us.us.3.html. Sardar, Ziauddin. Introducing Mathematics. Totem Books. 1999. Welch, S.C. (1972). A king's book of kings: the Shah-nameh of Shah Tahmasp. New York: The Metropolitan Museum of Art. ISBN 9780870990281. Wikimedia Commons has media related to Culture of Iran.